This is kind of a different blog post for me, but I really wanted to share this story with you. 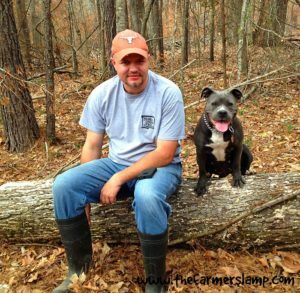 Almost 3 months ago, my husband saw a sign at our farm supply store for blue pit bulls for sale. He had been looking for one so we decided to go and take a look. When we arrived we were shocked at what we found. An elderly man, who had recently had a stroke, was trying to care for at least 12 dogs, various fowl, and a few other animals. He was obviously having a hard time doing this because Roxie (as we named her) and a few others were in very bad shape. 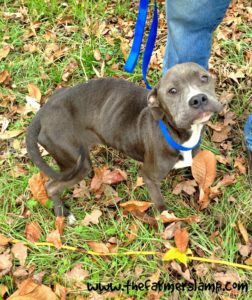 The male pit bull was healthy looking and full of energy, but Roxie was emaciated. When she put those soft dark eyes on me, I knew she was ours. We brought her home. This is what she looked like that day…WARNING: the picture is hard to see. She was not but a few days away from irreversible starvation. We also took another puppy who is a pit bull/catahoula cur mix we named Bully. He was not in as bad a shape and is another story all to his own. 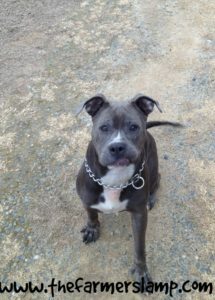 Roxie was 16 months old and had lived in a small yard with no human interaction. She had no discipline or manners. We knew this going in and had no reservations about helping her. We have been followers of Cesar’s Way for years now, so we felt equipped to handle the challenge of rescuing this pit bull. Boy are we thankful we did. After almost three months, she is a completely different dog. She is healthy, just a few issues left to deal with and they will resolve in short order with continued nutrition. I can’t wait for you to see the photos of her now. She obeys simple commands: sit, wait, stay (for a little while anyway), come, and a few others. 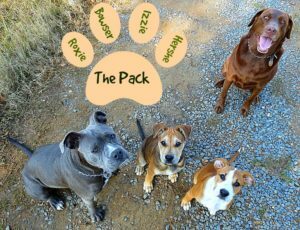 She is learning manners with the pack and her humans. 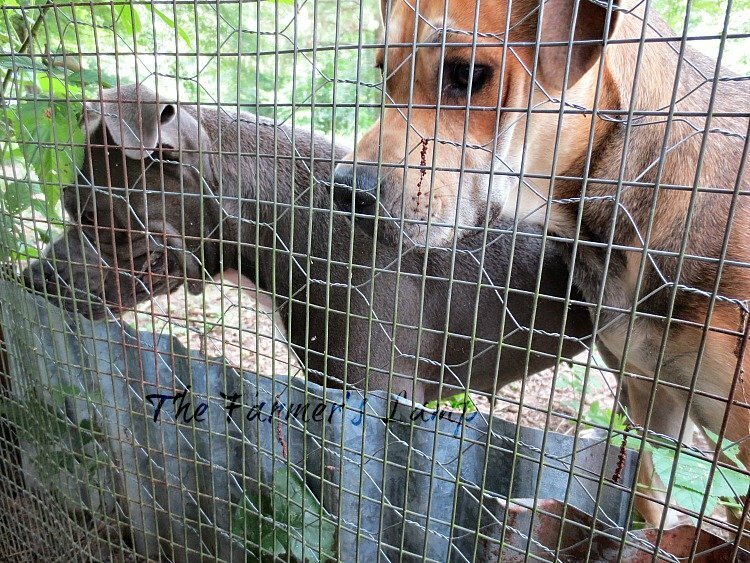 She has never been bred (thankfully) and has great maternal instincts as she demonstrates them with Bully. She no longer has any issues with food protection, hoarding, or gobbling. We can put our hands in her bowl, touch her, touch the food, whatever we need to do. She has learned her place in the pack and is secure in that. I must say I have never had a dog with as sweet a spirit as Roxie has. As you know, I am usually a Lab person, but I cannot say enough about this girl’s sweet attitude. The sterotype about dogs has to be exposed for the lie it is. Different breeds are just that, different. 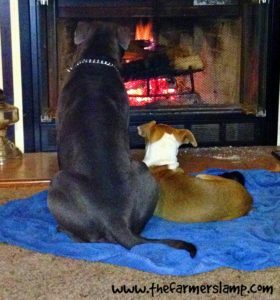 Some are more strong willed, energetic, and naturally disposed to certain behaviors, but how the dog is taught and treated is what results in the dog’s behavior. I can say that my chocolate lab is more stubborn on behavioral issues than Roxie. I was triggered to write this article because of the picture at the top, the one of Roxie with the flowers. We were getting ready for our pack walk and just before I was going to put on their leashes, Roxie trotted off into the fruit orchard. I assumed she had to use the bathroom so was going to wait for her. No, that was not what she was doing at all. 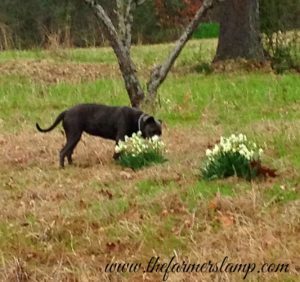 She went straight to the daffodils that were just blooming. She put her nose in them and took a very deep sniff. She seemed to say “aww” with her body and breath. Then she took one more nice deep smell, ran to me, and sat down to have her leash put on, tail wagging uncontrollably. I just was able to snap this shot, it all happened so fast. In that moment, I felt such gladness and so blessed that we had brought her to our home. I would have missed this pure expression of love, enjoyment, and peace of one of God’s creatures enjoying His creation. 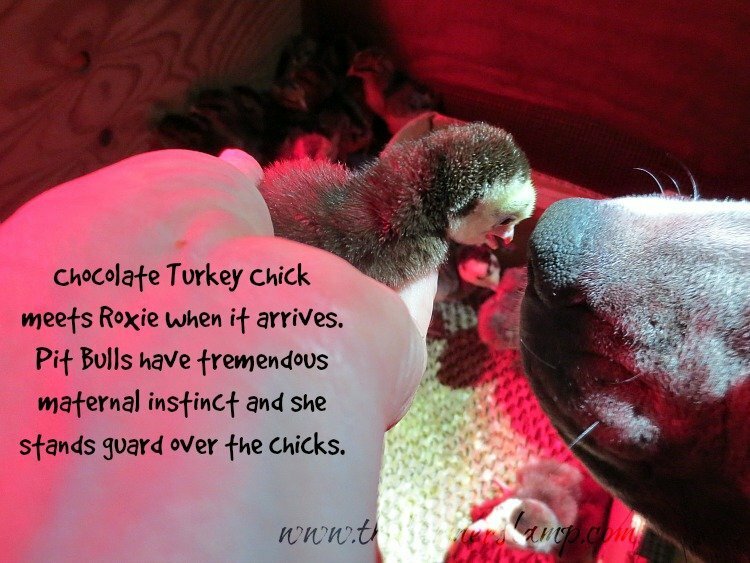 11/12/14 Update to this post: Roxie had her first litter of puppies on August 29th, we didn’t plan it that way because of the hard time she had already been through, but I wasn’t quite careful enough with the male pit bull. She did great and wanted me there the whole 12 hours! She has proven once again what great maternal drives pit bulls have. 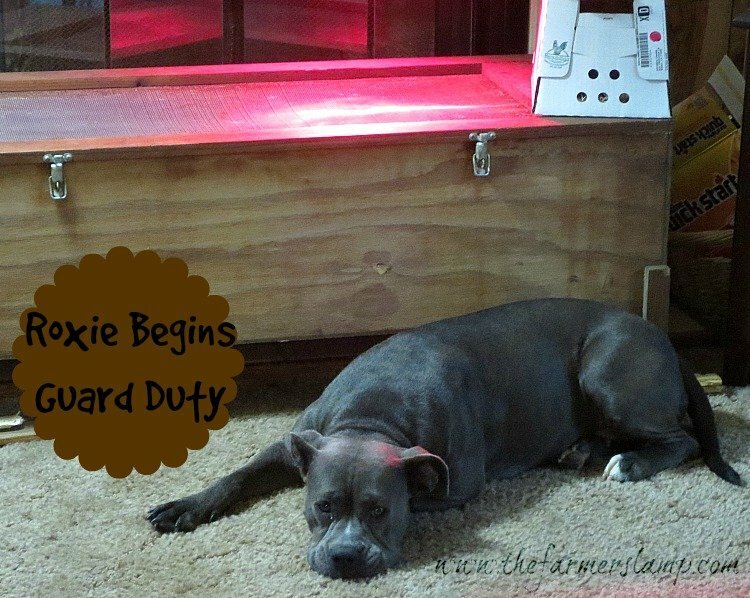 Roxie is doing great and is NOT going to have puppies for at least 2 more years. Roxie’s great maternal instincts continue to surprise and bless me. She will be three years old in August of 2015. The only lingering issue she has is small teeth and difficulty with tolerating the heat. She is healthy, happy, and home!